I’ve never eaten a lot of oatmeal. Growing up, grits was the breakfast staple in our household. It wasn’t that I didn’t like oatmeal. It was more about the fact that my mom didn’t really make oatmeal much. As a result, I’ve never been a big oatmeal eater as an adult. I guess it’s all about what you’re used to. That all changed once I tried baked oatmeal. I was working on my first cookbook when I wanted to include a breakfast supplemental e-book to offer as an incentive for preorders. Scanning through some old recipe cards, I found a recipe for baked oatmeal. An hour later I was in love. 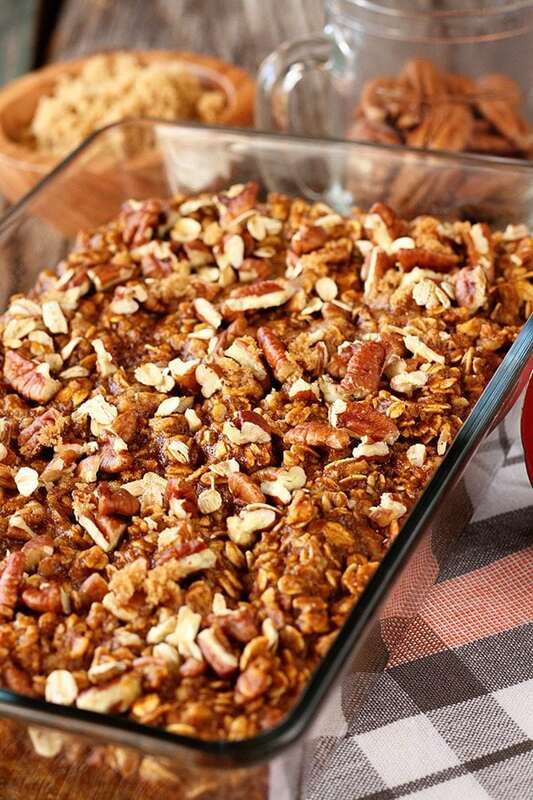 Baked oatmeal gives you all the great flavor and nuttiness of granola. It’s nothing like the gummy, sticky instant oatmeal I remember as a child. This stuff is amazing. I like it so much, I took that basic recipe and adapted it into several other recipes varying the flavors a bit. 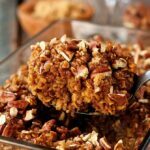 This Pumpkin Pecan Baked Oatmeal is my new favorite. 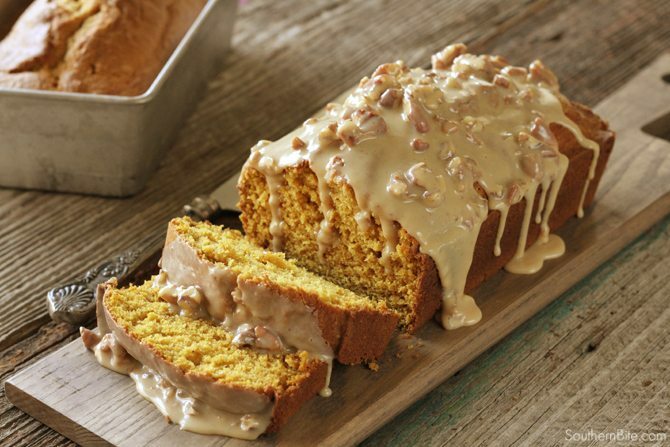 It almost comes out cake-like with an even nuttier flavor than the original recipe. 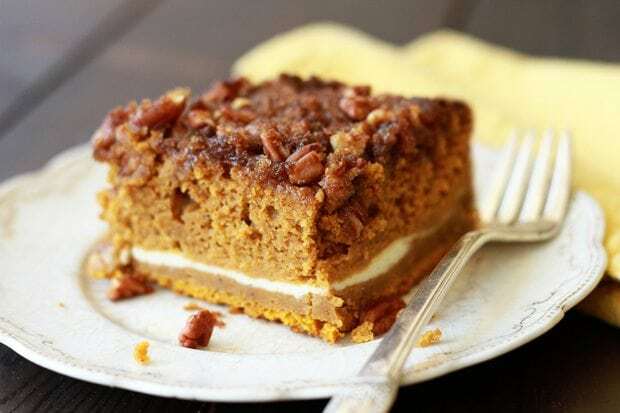 Combined with the classic pumpkin spice and pecan flavors of fall, it’s a real treat. Even my mom, who really doesn’t care for oatmeal, loves this stuff. It reheats well too. So much so, that I often make a batch of this on the weekend just to have as a quick and easy breakfast during the week. Y’all are going to love this not only because of the amazing flavor, but also because of how ridiculously easy it is to make. It’s one of those dump and stir recipes that will make your morning a breeze. Preheat the oven to 350°F and lightly spray an 8x8-inch baking dish with nonstick cooking spray. 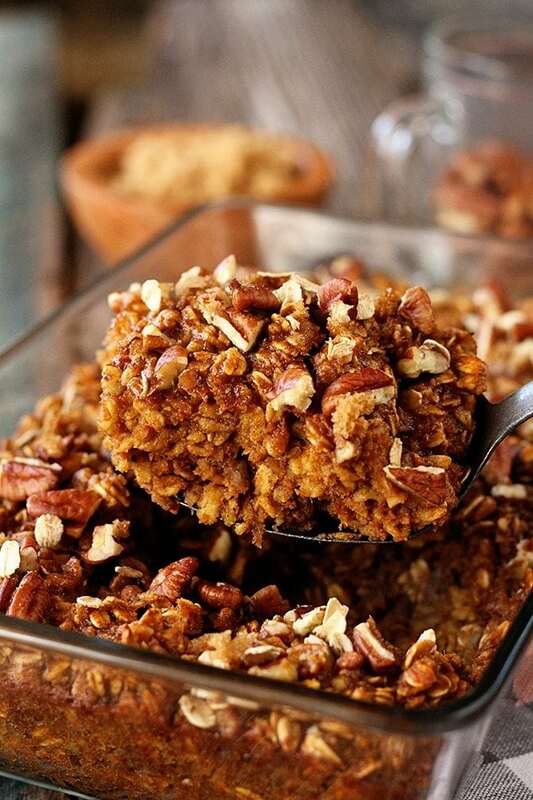 In a large bowl, combine the oats, baking powder, pumpkin pie spice, and salt. 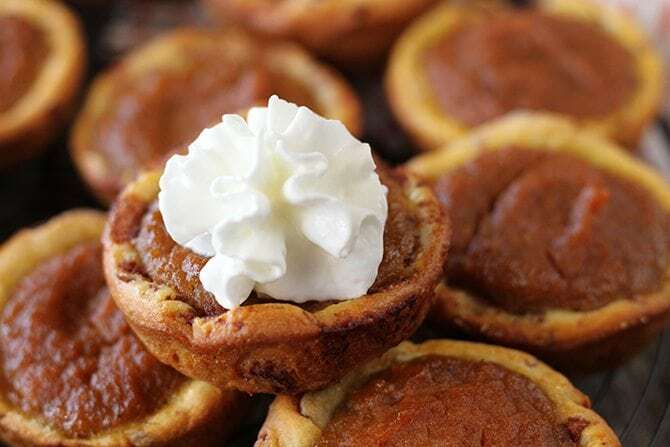 In another bowl, combine the brown sugar, milk, pumpkin, vanilla extract, and eggs. Mix well. Stir the wet mixture into the dry just enough to get it moistened. Fold in the pecans, reserving a tablespoon or so for the top. 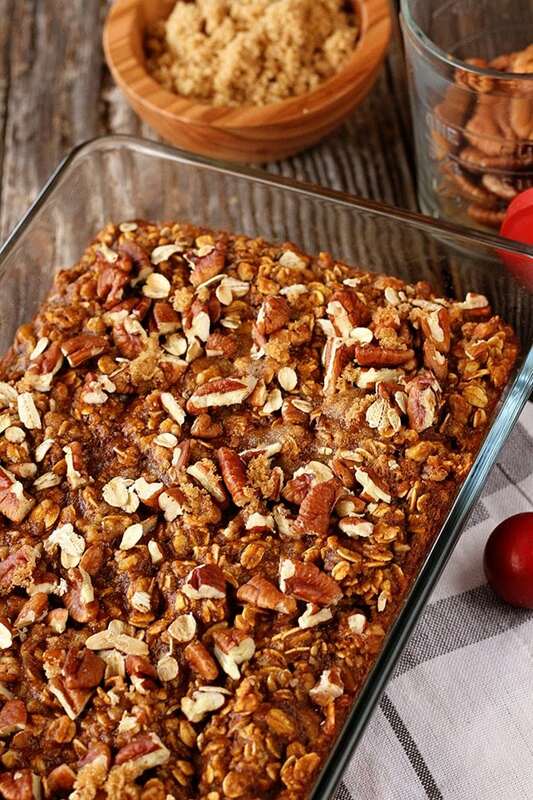 Pour the mixture into the prepared baking dish and sprinkle with the reserved pecans. Bake for 35 to 40 minutes or until golden brown and set. Could I use the one minute old oats? Hi Rosie! Old fashioned oats generally work best in this one. My husband loves steel-cut oats. Have you tried adapting it to those? I’ve not done that, but I’m sure it would be delicious. The cook time would be a bit longer. The next time I make this, I’ll try them in it. Yes! 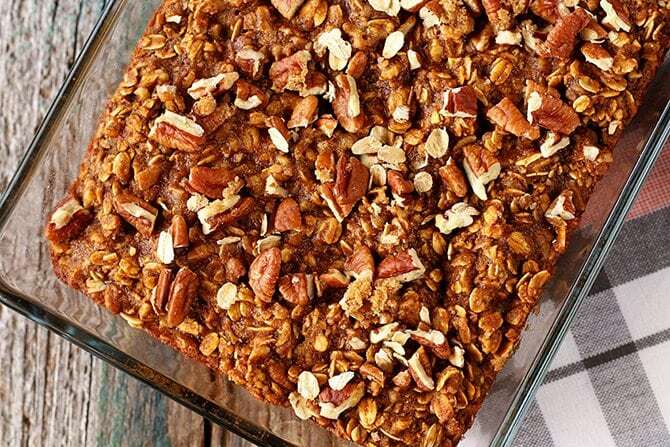 You can take a big scoop and eat it fresh out of the oven or cut it into squares after it’s cooled and reheat for busy mornings. Regardless, I prefer it better warm. Looks yummy and sounds easy to make! Can’t wait to try it with some maple bacon! There is only one of me usually. Is this something I could make and freeze individual servings to be reheated? Absolutely! This works perfectly like that! Have you ever doubled this and baked I need a 9 X13 pan? How long would you bake it? I haven’t done that. If you try it, the cook time shouldn’t be too much longer. You’ll just need to check it frequently.